Symbols file: select the name of the file containing the symbols list. The format of this file is described in the Symbols File Format section. The name of the symbols file can be entered by typing it, by selecting it in the Symbols List File dialog, by dragging and dropping it from an Explorer window (be it a shortcut or file name), or from the command line (see the Command Line section). Edit symbols list: open the currently selected symbols file in the default text editor (notepad if the symbols file has extension .txt). Download Directory: select the directory where downloaded data will be saved. The data for each symbol will be saved in a file with the name of the symbol and the extension selected in the Options dialog (see the Options section). The data path can be entered by typing it, by selecting it in the Data Path dialog, by dragging and dropping it from an Explorer window, or from the command line (see the Command Line section). Explore data download folder: open an explorer window with the selected output directory. Time Range - the range of dates for which to download the data, either all available data or a specific range. Each time the application starts, it will set the start date to hold the same value used in the most recent session, and the end date to today's date. It is also possible to set the start date to "None" (empty date) in which case the data will be downloaded starting with the earliest date available. Update - when checked, the application will attempt to update the data. When this option is on, if the data file for a symbol already exists, it will add only the new bars, up to the end date or if all is checked, up to the most recent date. If the data file doesn't exist, it will create it and load all the data for the specified time range. This option is automatically turned off if the "Most recent bars last in file" option is off. By default, in Update mode, old data (that was already present on the system) is not changed, unless it has become inconsistent with the new data. This can happen if adjustment is turned on and there have been recent splits or dividends. In that case, the adjustment factor is now different for old data than it was at the time it was originally downloaded. To maintain data consistency, YLoader will then reload all data, not just the most recent. There are cases however when this data reloading is undesired, such as when data is manually modified on disk, perhaps to correct bad bars. In that case, this behavior can be disabled by checking the corresponding option in the General Settings dialog, or by using the flag -w from the command line. Period - the data period: can be daily, weekly and monthly. Dividend and split adjusted - when checked, downloaded data will be adjusted for dividends and splits. Validate prices - when checked will verify that each bar has valid data (high > open, close, high etc). The Options dialog contains extra settings used to fine tune the validation process - see the Options dialog section. Single data file: used to save all downloaded data to a single file. Click this button to select a file the single data file name. The file name can also be entered by typing it directly into the associated edit box, by dragging and dropping from an Explorer window, or from the command line (see the Command Line section). Also, a list of most recently used eight output files is available by clicking on the side arrow down button. If this field is left empty, the single data file will not be generated. View/edit the output file: open the currently selected output file in the default text editor (notepad for txt files) for viewing or editing. Downloaded symbols info - detailed info about the downloaded status of all symbols. Indicates whether the download was successful or not, the symbol, and a message showing how much data has been loaded, for a successful operation, or a diagnostic message in case of a warning or error. 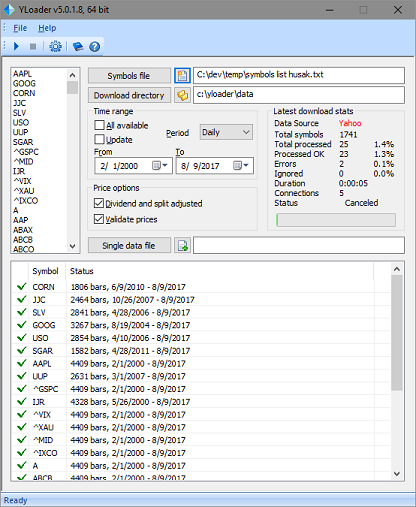 To open a symbol data file directly from YLoader, double click the symbol name in the symbols list, or the line containing that symbol in the download status list. By default, the application associated with the file extension is used to open the data file. For example, if the extension is txt, notepad will be used, or for csv, Excel will be used (if installed on the system). It is possible to use any application to open data files - go to Setting/General Settings and enter the full path of the application to run. The list of symbols will ignore duplicate symbols. Symbols are considered duplicates if they have the exact same spelling, regardless of the case, so msft and MSFT are considered duplicates. if a change in the previously loaded data has occurred between the time of the last download and the current download, then all data is reloaded. This can happen if for example there has been an adjustment (split or dividend) between the previous and current update, in which case all the data for that symbol will be changed to reflect the adjustment. This behavior can be disabled if desired, by checking the option "Do not reload old data in Update mode" on the General Settings page in the Settings dialog. the various options (data and file format, adjustment etc) must be consistent between updates. If an output file is specified, it will be created by copying the content of all the data files that were generated during the downloading session to this file. If this file already exists, it will be replaced with the new content. The data files for individual symbols are not deleted after this operation. The order in which the data files are copied to the output file is not guaranteed, unless only one connection is used to download data. Only data for symbols that were successfully downloaded is copied to the output file. All available data for those symbols is copied, regardless of whether the downloading was done in update mode or not. The output file tends to get very large, so opening it with Notepad after a downloading session can be a lengthy operation as Notepad loads the entire file in memory.